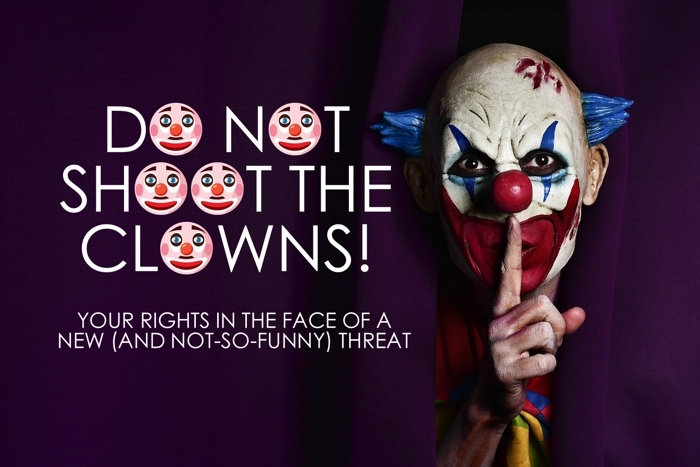 Hold Your Fire…Don’t Shoot the Clowns! Yet. Recently, a friend asked me if it was legal for individuals to dress as clowns and scare the public. He also wanted to know what would happen if he were frightened by one of these clowns and shot the clown. While not asking the latter in complete seriousness, these questions do bring up potential criminal law issues. Is it Legal to Dress as a Clown in Public? There’s no state law that we’re aware of that makes dressing up like a clown in public per se illegal. The only potential laws that may be applicable to these situations would be individual city ordinances. A search of city codes in a handful of Texas towns around the Metroplex reveals no ordinance specifically prohibiting dressing like a clown in public. The only codes we are able to find related to costumes primarily had to do with a prohibition on costumes which fail to cover private areas in regards to sexually oriented businesses. While dressing like a clown doesn’t appear to be per se prohibited, there is certainly the risk of breaking other laws while dressed as a clown. In addition, dressing like a clown in public and creating unnecessary alarm or panic could be deemed as disorderly conduct. 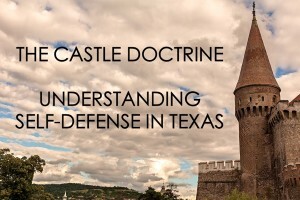 Texas Penal Code, Chapter 42 lays out a list of behaviors that could constitute up to a Class B misdemeanor. Class B misdemeanors can carry a penalty of up to 6 months in jail and up to a $2,000 fine. Sec. 42.01 (a)(2) states that a person commits an offense [of disorderly conduct] if he intentionally or knowingly makes an offensive gesture or display in a public place, and the gesture or display tends to incite an immediate breach of the peace. An offense of this nature is a Class C misdemeanor and carries the possibility of up to a $500.00 fine. Can I use Deadly Force Against the Clown? Let’s start with the simple answer of “NO”. While individuals may be suffering from coulrophobia (the fear of clowns), this condition does not give you a right to use deadly force – or any force for that matter – against an individual simply because he or she is standing in public dressed as a clown. The more complex answer of “maybe” would have to do with the use of force for self-defense purposes. Section 9.31 of the Texas Penal Code provides for a justifiable defense at the time of trial for self-defense, so long as the type of force used is reasonable and necessary in the moment to protect against an attacker. 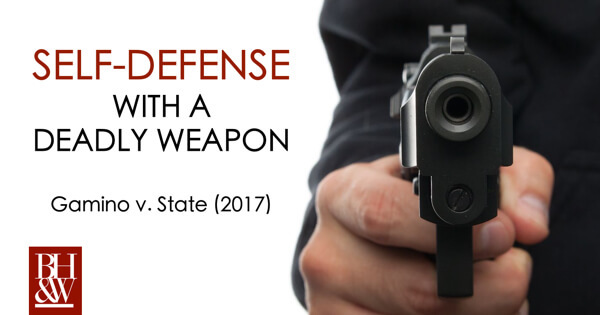 Under this law, the actor must reasonably believe that the force is reasonably necessary to protect against the other’s use or attempted use of unlawful force. Simply observing a clown, with no weapon or threat to use a weapon, provides no grounds to use force – much less deadly force – against that clown. In addition, the Penal Code does establish that force may be used to protect one’s own property. 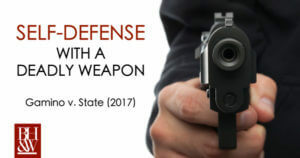 A person in “lawful possession” of real property or personal property is justified in using force if “the actor reasonably believes the force is reasonably necessary to prevent or terminate the other’s trespass on the land…” However, the use of deadly force to protect one’s own property is limited. “A person is justified in using deadly force against another to protect land or property if (1) he is justified under TPC §9.41; (2) he reasonably believes using the force is immediately necessary to prevent commission of arson, burglary, or robbery; and, (3) the actor reasonably believes that the land or property cannot be protected or recovered by any other means [such as by calling law enforcement]. Tex. Penal Code Section 9.42. 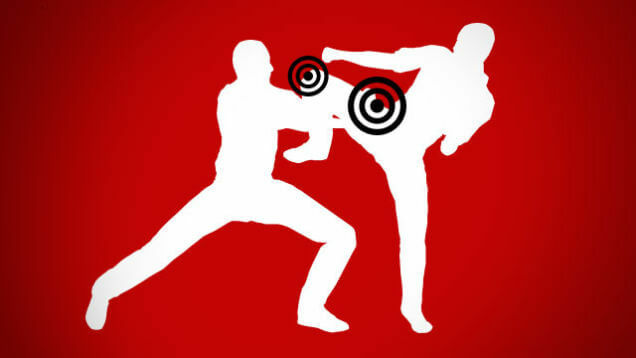 Using force for self-defense purposes is a serious response to dangerous and threatening situations – but certainly not an appropriate response to being “creeped” out. Dressing up as a clown and causing fear amongst the public is a stupid (and perhaps even illegal) idea. Our attorneys would advise you strongly against it. You certainly place yourself in the position of having your behavior scrutinized by law enforcement for any potential illegal activity. And, if you’re simply afraid of clowns, do your defense attorney a favor and please do not shoot them. BUT…If the clown lays a hand on you or chases you through a park, all bets are off. You may use force against the clown to avoid an assault.